Per head cost 214 Rs. 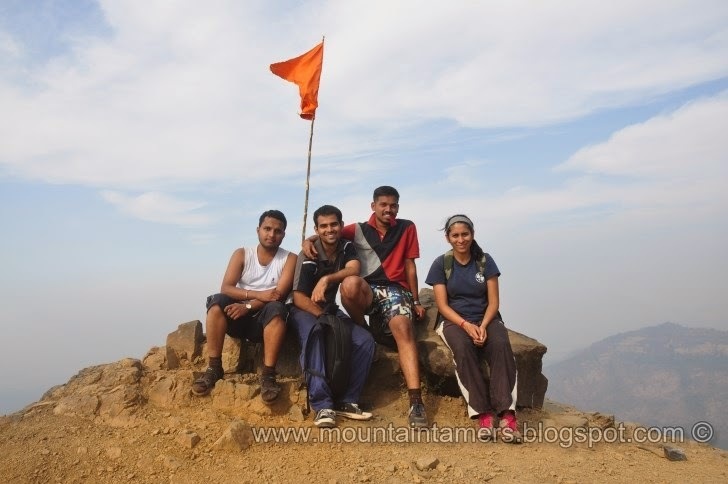 Completed this trek in one day, starting from Panvel at 8.00 AM. The state transport bus was running late by 30 minutes, a bad start I must say. 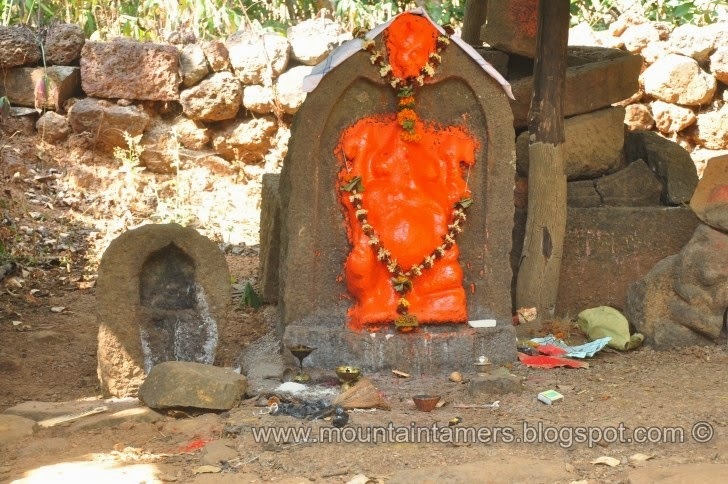 We started the trek at 9.00 AM sharp from the lord Hanuman (हनुमान) temple. The previous visit to Kalavantin durg (कलावंतीण दुर्ग) from Thakurwadi (ठाकुरवाडी) village had simplified a few things for us. This time we took several shorter routes to the otherwise long and zigzag route till Prabal Machi (प्रबळ माची) and reached the plateau at 10.00 AM. 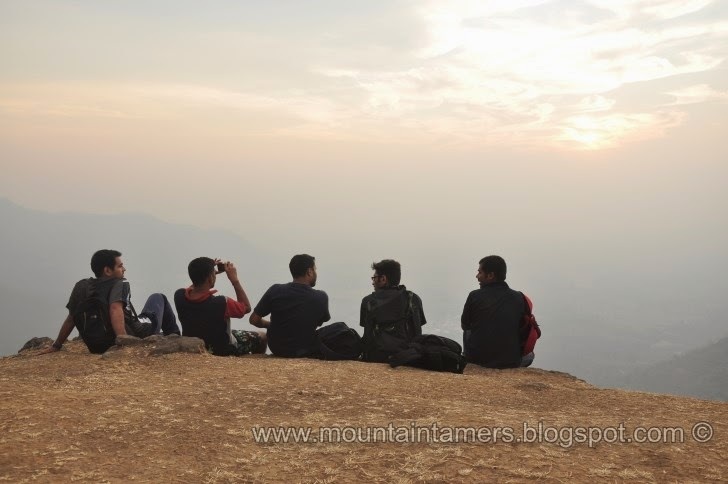 Many trekkers and picnickers prefer to stay at Prabal Machi to visit the duo. 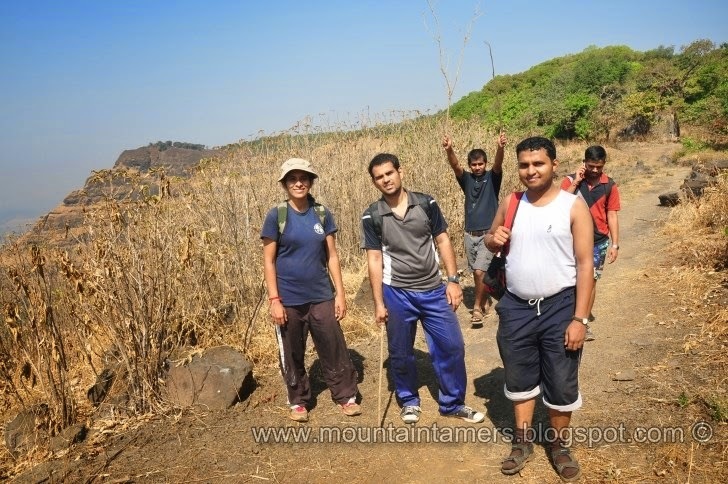 But our plan was to complete the two treks in a single day. We entered the village and exited from the extreme right, crossing the first few electric poles, parallel to Prabalgad (प्रबळगड). 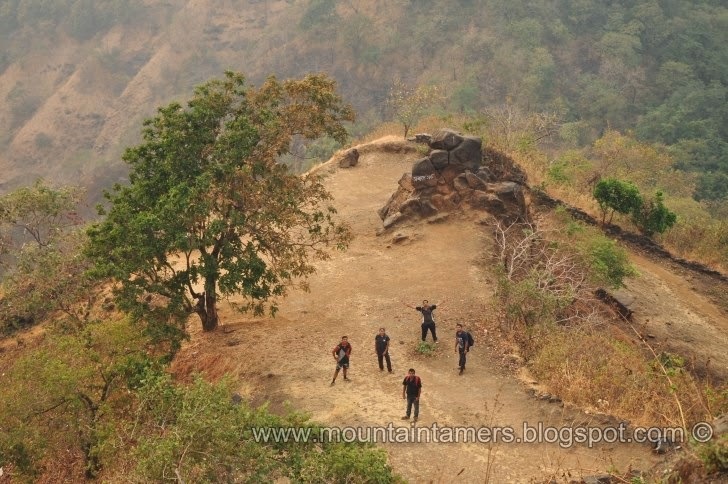 Our plan was to enter the fort from the V-shaped gully, also known as Bail Shingi chi vaat (बैल शिंगाची वाट). 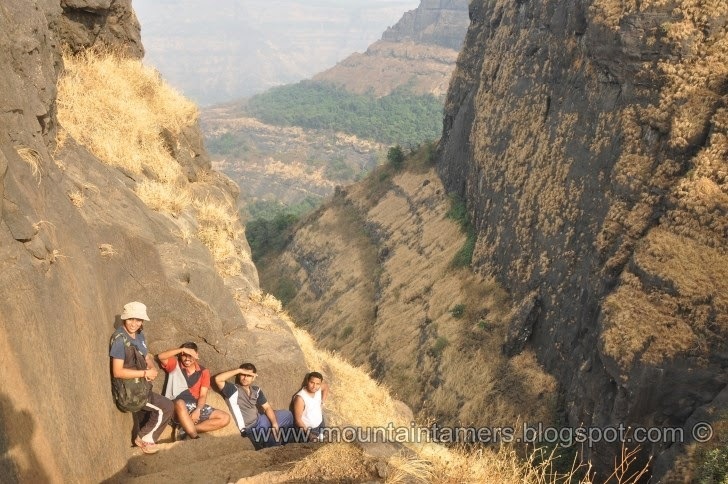 Most of the route to Prabalgad is covered by the forest and hence offers quite a 'cozy' climb. The gully is made up of several boulders- both loose rocks and scree at few places. 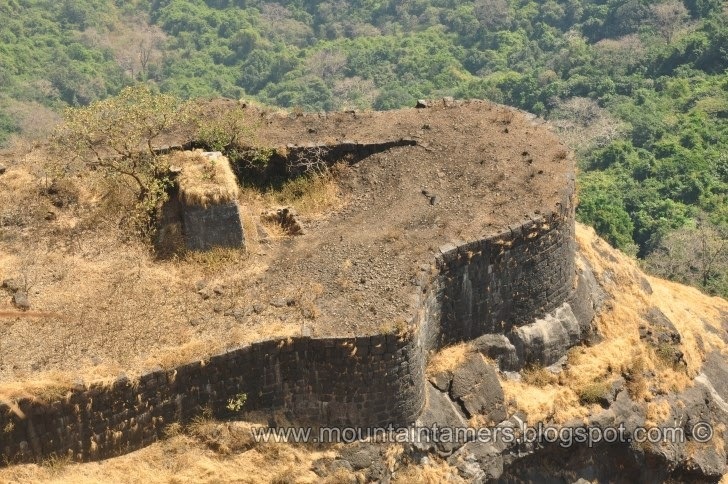 The steep, rock-solid stone on both the sides tapers towards the main entrance of the fort. Although the main entrance (महा दरवाझा) lies in a dilapidated condition, we still can visualize how it could be back then. 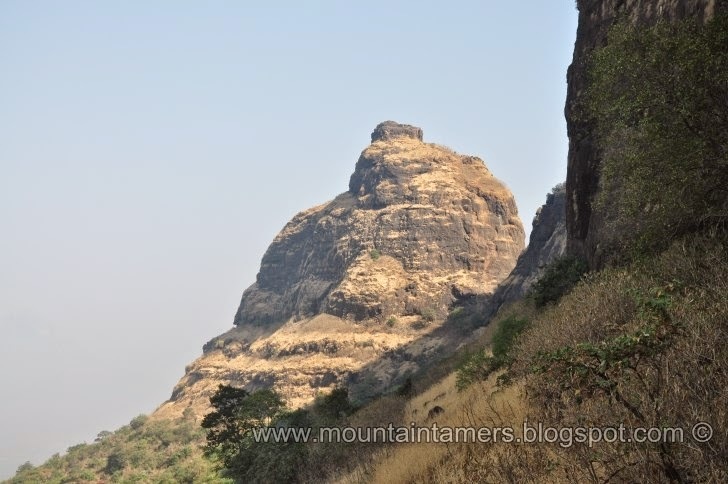 This whole route reminded me of the climb to Hargad (हरगड) fort (the one from Baglan region). Once we reached the top an old, rusted iron board welcomes us. 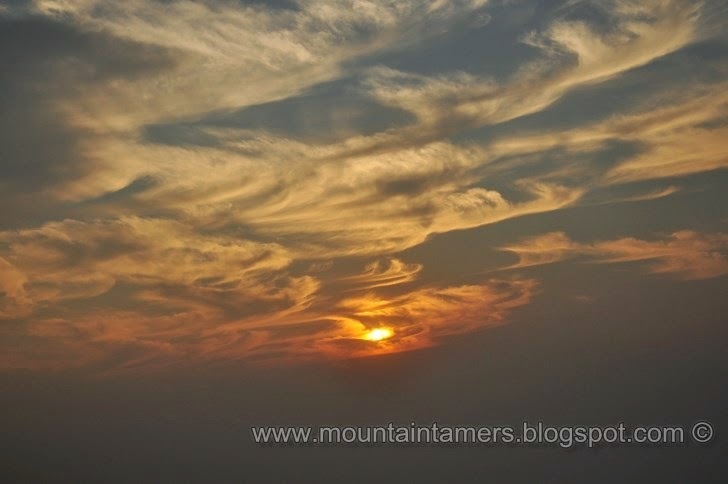 It has the detailed description of all the worth-visiting places on Prabalgad. The route bifurcates from here to North and South directions. the left one goes to the edge from where we can see the Kalavantin pinnacle, and the right one goes up to the Kala Buruj (काळा बुरूज). We started off to the Kala Buruj point. Well, the top is mostly a forest patch. A dense one, I would say. 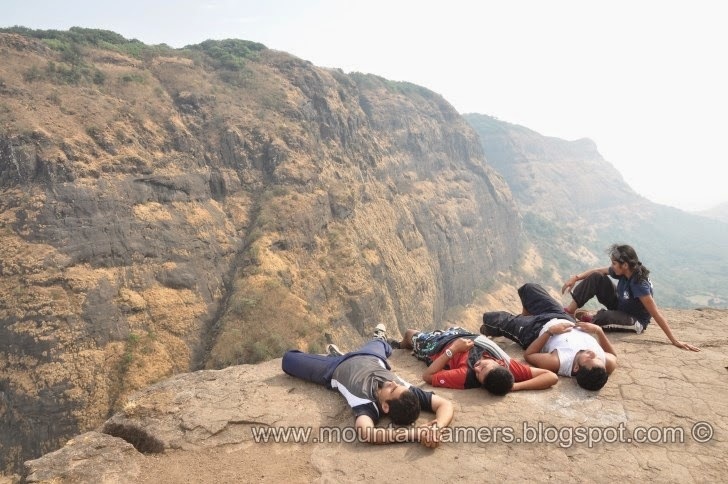 Akin to Matheran. I read it somewhere that Prabalgad was first on the list of government to develop as a tourist destination. But several factors, like lack of perennial water source on the top, accounted for the failure of the plan. But that is what kept Pabal, untouched from the evil forces of Tourism Industry. That's the Kala Buruj !! Plateau of Prabalgad is no doubt huge. 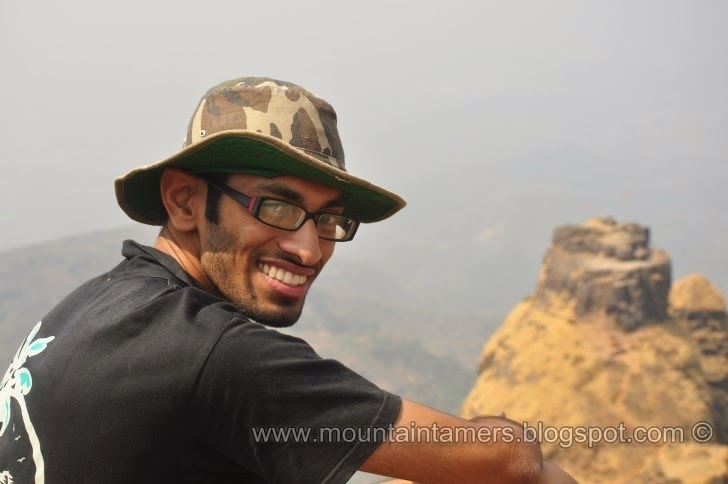 But Matheran is even bigger. Water at Prabalgad is available at both the ends (N/S). There are two water cisterns dug out into the solid-rock foundation at the southern end. Other water sources are hidden inside the thicket of trees and it is possible to access them with the help of a local guy. 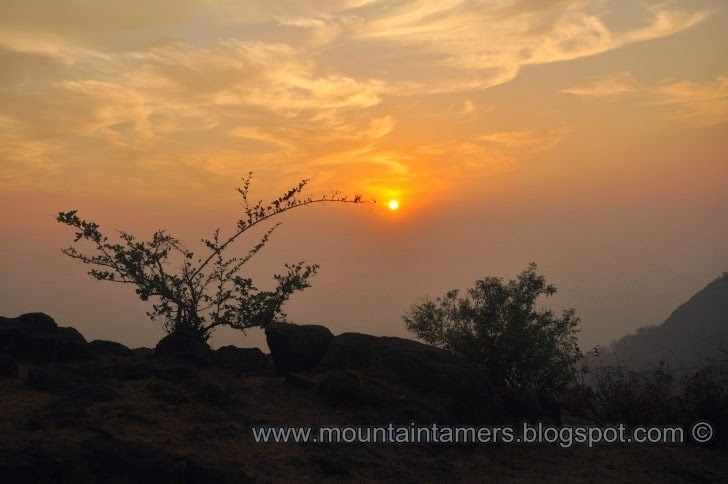 We could see Matheran, Manikgad, Irshalgad, Morbe dam, Mountain of Sondai, Peb fort from the southern tip. It was 12.00 Noon. 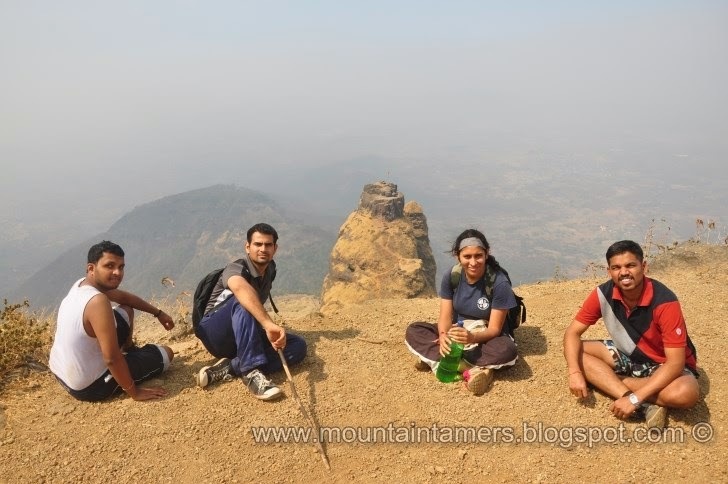 We had light snacks under tree shade and proceeded to the Kalavantin view point (north tip). We reached there in one hour (at 1.00 PM). Even here there are two water cisterns (hidden inside trees). 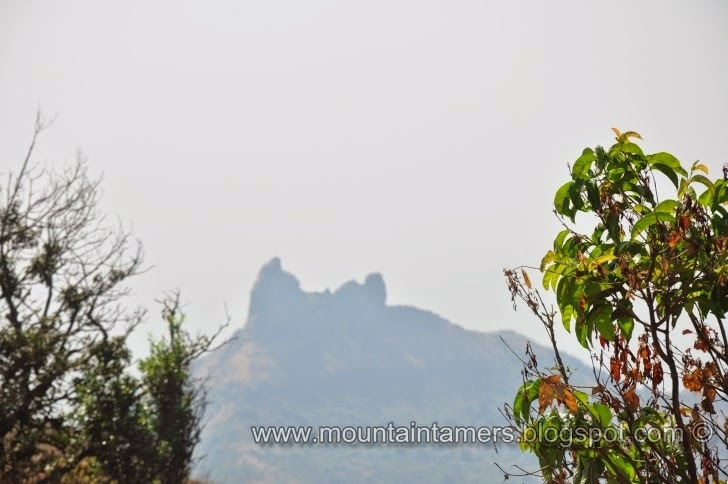 From this tip we can sight the Chanderi fort, Mahismaal, ShriMalangad, Ganesh-Kartik pinnacles and Kalavantin (right in front). Kalavantin as seen from Prabalgad. 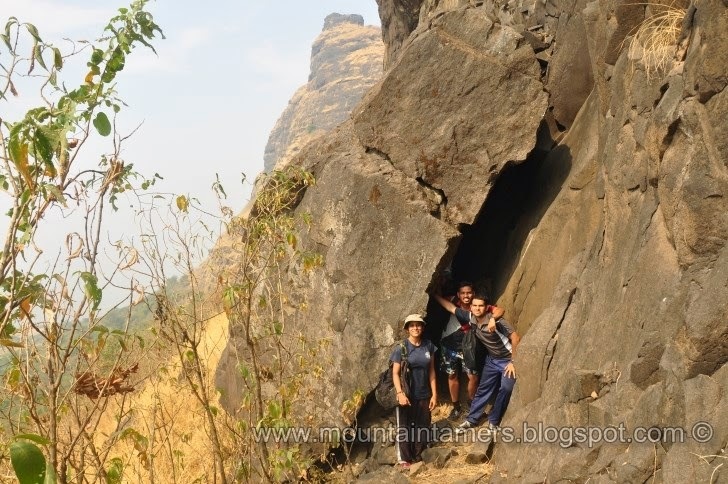 We descended through the V-gully and took the traverse till the Kalavantin-Prabalgad col or khind (खिंड). The less trotted route was hardly a foot wide. We could see several honey combs aigned on the overhang cliff of Prabalgad. The trail was broken at several places and was sometimes covered by the boulders. We reached the col at 2.30 PM, rested for ten minutes, an again started the climb for Kalavantin. The final rock patch seemed easy this time. We met a trio near the rock patch. They couldn't find the way to reach the top and were waiting for us (They happened to spot us from the top, traversing the Prabalgad). We showed them the route and they followed us to the top. Woohoo !!! We reached the top at 3.00 PM. We had successfully carried out our plan. It was a time to relax now. Well, we had covered up a long distance while walking continuously, without taking short breaks in between (except for the snack time). So we decided to spend a few moments here, experiencing the tranquility of the mountains. We were all alone on the top with nobody to disturb us. 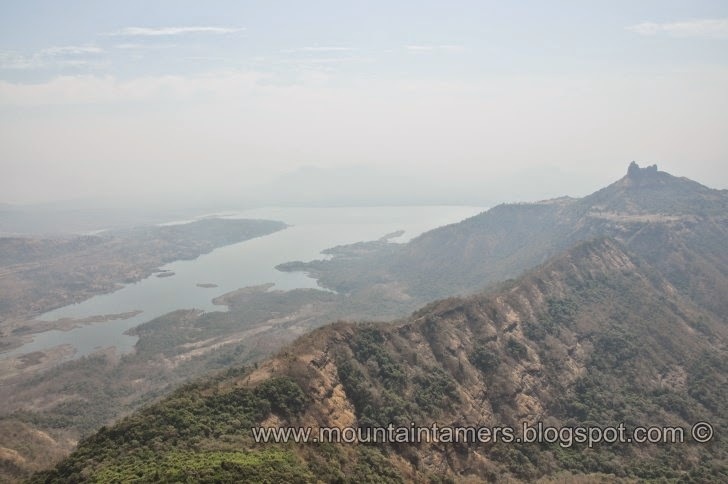 It was fun, just staring at the vast Sahyadri tops, watching the golden eagle glide across the valley and tweeting swallows making sharp turns while in flight. The trek as now almost finished with all the goals achieved for the day. We reached the Prabal Machi at 4.15 PM. Everyone was hungry. We didn't had a proper lunch for the day, and it was our lunchtime now (yes at 4.15 PM). With a heavy lunch, lemonade and tea it was time to move on. It was almost sunset now (at 6.00 PM). We reached the Thakurwdi (ठाकुरवाड़ी) village at 7.15 PM and decided to rest at the lord Hanuman temple, and it seemed legit since it was saturday (शनिवार). Our ride to Panvel arrived at 8.08 PM, just in time for us to catch the 9.14 PM CST local train from Panvel station. Group: Aaditya Gurav, Manoj Patil, Ninad Vilankar, Tarun Kaushik, Yamuna (my sis) and me.